Today, on Vivificat, Teófilo de Jesús posted a quote by a Carthusian monk. Interestingly enough, when I tried to visit his site, Google told me to stay away because his site was infected by Malware. I don't understand computers but this was all bogus and it was soon fixed. When I got to the site and read the message, it was as if God was speaking just to me. What a consolation and encouragement. Tears of relief come to my eyes with this quote because my private prayer has been a wordless encounter with Light and Joy for a long time. No effort on my part; I just glance in His direction and Christ takes over. Praying like this, it is easy to feel slack, lazy.... . 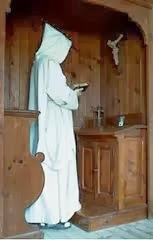 The Wound of Love By A. Carthusian "Solitude is the place of prayer" first published in 1994 by the Carthusian Order in England Solitude is the place of prayer. The only true prayer which radiates there is that of Jesus: all other prayer is a reflection of the light that shines forth from his face.